I ran this scenario at a convention (after having played it a few weeks prior) and enjoyed this. It was more fun for me to GM than play even. It's a great lead in for War for the Crown, but also has several fun callbacks to earlier scenarios (which, sadly, none of the PCs had played with their PCs). My only significant gripe would be the massive map (used near the end) which, although fun, isn't terribly conducive to convention play. Normally when I get newly released PFS scenarios as a Venture Officer, I download them and scan over them a bit, looking at which maps they use, how long they are, and how neat the art is. This has been useful for my local GMs as it's enabled me to give them head's up about scenarios that are longer (#8-25, #9-07) than others, or ones with complex custom maps (#9-06) that might require more prep-time. I also do this to try and partially sate my curiosity while simultaneously allowing for the possibility that I'll maybe be able to play a new scenario before GMing it! In this case, well...after my jaw needed a manual assist in order to close after several minutes of drooling at the cover art, I started skimming. I couldn't help but catch some of the sidebar headers, which made me grin even more as I considered the callback possibilities hiding here. By the time I found the "big" map, my will saves had failed me - I went back to page one and just started reading the scenario cover-to-cover, prepping to GM it immediately - I couldn't resist! 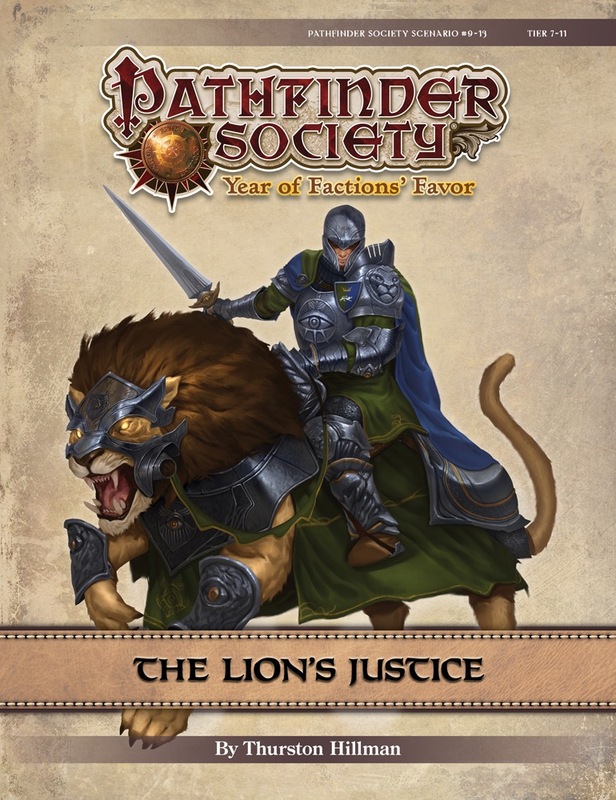 The Lion's Justice does not disappoint! Thrilling story hooks from the moment the PCs get into the briefing, well-written dialogue that is straightforward but doesn't feel like it's "railroading" the party, call-backs all the way from Season 1 that do fit the story, challenging combats that are very well balanced for tier 7-11 PFS play, and (a personal focus of mine when writing scenario reviews) a truly epic plot that the characters can learn during play (rather than only being able to understand by reading the GM material)!!! This scenario ticks every single box for me as a GM and as a player (who was fortunately able to bring his Taldan Cavalier to play in it a couple of weeks after GMing it). When I GM'd this, I also incorporated art from Book 1 of War for the Crown and created a playlist/soundtrack to enhance the atmosphere! The Lion's Justice is, for me, such an exceptional scenario that it is totally worth the extra effort! The Lion's Justice is, far and away, my favorite of Season 9 to-date and easily a contender for one of my favorites of all time! I played this tonight and thoroughly enjoyed it. Seems to be packed full of flavour for Sovereign Court. We just eeked into full on high tier which, as a level 9, left me feeling more than a little nervous. A very lucky burst of radiance at the end pretty much guaranteed us victory fortunately. I will leave a more detailed review once I have run it. It definitely went right up to the top of the list of scenarios I want to run. So I thought this scenario was great. Super cool story and fun stuff going on. But there was something that kinda really bugged me. In one part the only way to succeed is with a SUPER high trained only skill DC and have no alternatives and have it cause a loss of gold. That's just really upsetting. It's so high that people that are good at the skill have a large chance of failing. So. Back to Oppara once again. I don't know what brought this on, but the hype is undeniably real. I trust this man to destroy both me and my characters. Surprised we're even allowed within a hundred miles of that place. Oh, sorry! I think I missed this question. This also makes use of a very large custom map borrowed from an upcoming Adventure Path volume. I recommend picking up a product like Pathfinder Flip-Mat: Bigger Basic in order to draw a big hunk of it all in one go.